The Mandara Mountains are a volcanic range extending about 125 miles (200km) in northern Cameroon, along the border with Nigeria. Hiking in the remarkably beautiful landscapes of the Mandara Mountains is one of the most popular activities for tourists exploring Cameroon. The spectacular rock formations and lush valleys and hills are interspersed with traditional villages with round huts, where visitors can experience authentic local culture. The Mofu ethnic group dominates the region and the hillside villages subsist mainly through terrace farming, with sorghum the principal crop. One of the most famous of these villages is Rhumsiki, which is stunningly situated in rugged mountain scenery. Other notable villages worth a visit include Djingliya, Tourou, Koza, Maga, and Mora. Foreigners are likely to be welcomed warmly in all these villages and the best way to explore the lovely region is by trekking from village to village. Unfortunately, the British Foreign Office, and a number of other travel authorities, warn against travel to the far north of Cameroon and particularly along the northern section of the Nigerian border. 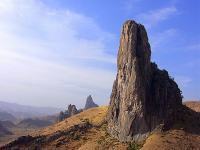 The Mandara Mountains are not considered safe for tourists because of the ongoing conflict just across the border in Nigeria, which may spill over into the otherwise peaceful mountains. Those adventurers who choose to ignore this advice and enjoy hiking in the region should take every possible safety precaution.